I learned how to cook lamb stew because it is the favorite of the traditional Irish recipes for most of the Irish people. Irish lamb recipes are so popular and stew is a hearty and robust dish so welcoming to a colder damp climate like Ireland. This recipe was traditionally made with lamb or mutton. The long cooking period for stew allowed time to tenderize the cheaper more available cuts of meat. These recipes can be conveniently prepared early in the morning and left on all day cooking. I learned how to cook many lamb stew recipes, each adding a variety of other ingredients at the time of making. Because potatoes have been so abundant in Ireland, they are almost always included in the recipes. You will find recipes which also include parsnips, turnips, onions, carrots and many other locally grown vegetables. Many people also like to add grains to their stews like barley. You will also find recipes in which locally brewed beer and whiskey is used to enhance the flavor. 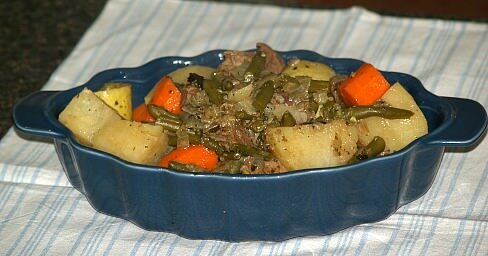 I learned how to cook lamb stew like this Irish stew. In a large skillet, brown the onion and the lamb in hot oil. Put in a slow cooker. Add the remaining ingredients and stir to blend well. Cook for 6 to 8 hours until meat is tender. NOTE: you could put these ingredients in a covered roaster instead of a slow cooker and place in the oven at 350F degrees for 1 to 2 hours, checking meat for tenderness. You may need to add a little water if it get too dry. I do this quite often. Many stew recipes as well as most Irish stew recipes include many locally grown vegetables making these dishes very healthy. In large heavy pot brown meat in hot butter; add onions, garlic, mint, parsley and seasoning. Sauté mixture until tender; add enough hot water to cover meat, cover with lid and simmer on low heat about 1 hour or until meat is tender. Add desired vegetables and continue to simmer until vegetables are tender. This is one of the lamb stew recipes prepared with dumplings; it is delicious. Cut three pounds of lamb into 2 inch chunks. Put meat into heavy kettle and cover with boiling water. Cook slowly two hours or until tender. After cooking 1 hour add ½ cup each carrots and turnips cut in ½ inch pieces and 1 sliced onion. Combine dumpling recipe and have ready. Fifteen minutes before serving add 4 cups precooked sliced potatoes (parboil before adding). Dilute ¼ cup flour with enough cold water to form smooth paste; stir into stew. Season with salt and pepper and drop dumplings on top of stew. Cover pot with lid and steam until dumplings are cooked. Combine and sift dry ingredients; work in small pieces of butter. Gradually blend in milk; add enough milk to be able to drop by spoonfuls. In a large Dutch oven, roll shanks in flour and brown in hot oil; remove from pan to platter. Brown carrots and potatoes lightly; place on platter. Add chopped onion and garlic to pan with hot oil; stir and brown. Return lamb shanks, potatoes and carrots to pan with onion and garlic. Add whiskey, tomatoes, chicken broth, sugar, salt and pepper; stir to blend. Bake about 90 minutes or until tender.